We observed earth hour this weekend with good friends. Candles, wine and battery-operated tunes set the pace for the evening. As is standard with this group of friends, we also prepared far too much food. - kongnamool (soybean sprouts), which I initially thought I turned into something capable of causing nuclear meltdown when I substituted hot chili oil for Korean chili powder, but after it denatured in the fridge for a couple of hours, it was actually super good. - pa jun (scallion pancakes) which at the last minute I struck from the menu, when it became evident that we already had far too much food. - jap chae glass noodles, which, interestingly, our guests brought as well. Exact same recipe too. There was definitely no shortage of noodles, although our friends made theirs with sweet potato noodles from a Korean grocery store, while I made mine with bean noodles from Co-op. They won the authenticity contest, hands down. I feel sorry for you that you couldn't join us, because it really was a fine evening. 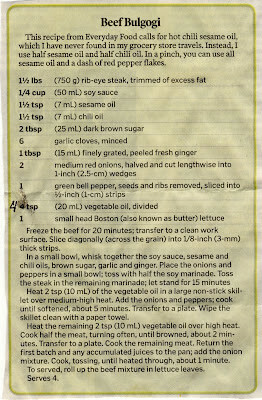 To soften the blow somewhat, how about if I share my top secret bulgogi recipe with you? I've never explored cooking Asian food although I like it very much. Seems easier to just go to the restaurants. It's not really all that hard, if you are in the proper mindset, Vicomtesse, although it certainly is easier to go to a restaurant. Sometimes you just want to stay home, though. The idea of a secret recipe is exciting to me, but the idea of cooking only sometimes. :) I'm copying this, though, because you just never know when the mood will strike. 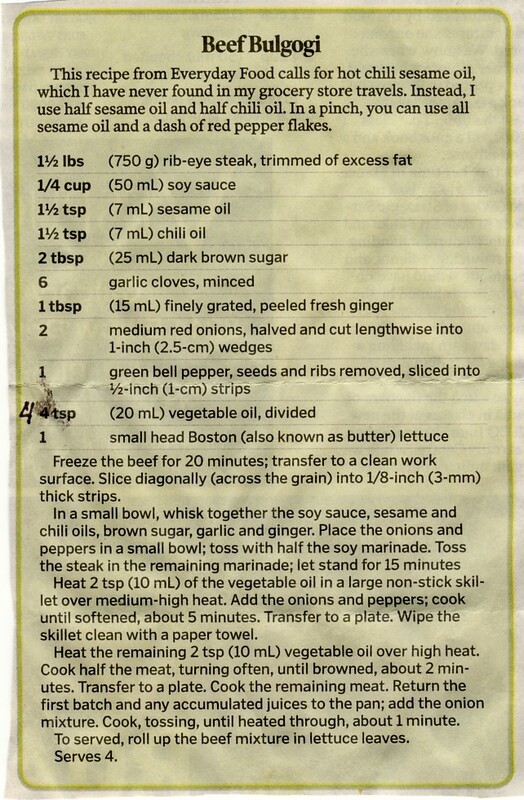 I will definitely bookmark this page for the bulgogi recipe - it looks way more exciting than the one I made the other day. Sounds like a great time and a great menu! After all these years, the idea of cooking isn't all that exciting to me either, Lesley, but I actually make the bulgogi fairly often. Evidently the mood strikes me more than I realized. It has a really nice flavour, WC. Not particularly spicey, but certainly intense. I hope you enjoy it. You know what, Susan? I bet it would be great made with tofu. And even less work, which makes it extra tasty.